The official website of Microsoft C# questions and answers to get you prepared for any technical interview or exam. 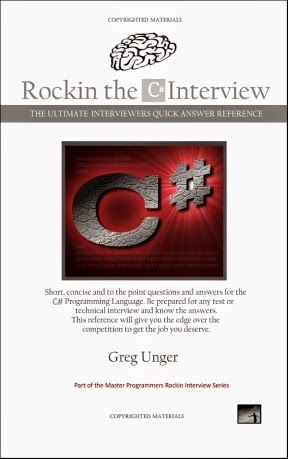 The information on this site is in the book Rockin the C# Interview by Greg Unger. It contains accurate, easy to memorize answers with no fluff. It is the Ultimate C# question and answer quick reference with hundreds of questions and answers to cover every important topic. The book also covers MVC, ASP.Net, ADO.Net, Entity Framework, WCF, Silverlight and OOP questions. Do you know when to use the different WCF Context Modes? Let's talk about WCF's InstanceContextMode, give a brief overview of the possible values and determine when to use them. InstanceContextMode is a property on the ServiceBehaviorAttribute class in .NET Framework 4.5. A developer will use the InstanceContextMode property to specify when new service objects are created. Because the service object is not directly connected to the communicating channel, the lifetime of the service objects is independent of the lifetime of the channel between a client and the service application. The default value, PerSession, instructs the service application to create a new service object when a new communication session is established between a client and the service application. Subsequent calls in the same session are handled by the same object. The default value, PerSession, instructs the service application to create a new service object when a new communication session is established between a client and the service application. Subsequent calls in the same session are handled by the same object. PerSession indicates that each service object handles requests from one client channel. A service configured for private sessions cannot typically support more than a few dozen (or perhaps up to a few hundred) outstanding clients due to the cost associated with each such dedicated service instance. PerCall creates a new InstanceContext object prior to and recycled subsequent to each call. If the channel does not create a session this value behaves as if it were PerCall. After the method call returns, if the object implements IDisposable, then Windows Communication Foundation calls IDisposable.Dispose on it. Single creates only one InstanceContext object. It is used for all incoming calls and is not recycled subsequent to the calls. If a service object does not exist, one is created. The singleton service is the ultimate shareable service. When a service is configured as a singleton, all clients get connected to the same single well-known instance independently of each other, regardless of which endpoint of the service they connect to. The singleton service lives forever, and is only disposed of once the host shuts down. The singleton is created exactly once when the host is created. • When you want to maintain states between WCF calls. • When you don't have very many concurrent connections and don't need to scale up. • When your service holds intensive resources like connection and huge memory objects. • When scalability is a prime requirement. • When your WCF functions are called in a single threaded model. • When you want share global data through your WCF service. • When scalability is not a concern. A really good post,Its really very informative and interesting.it answers multiple questions that I had.Thanks a lot for sharing valuable information with us. Thanks for sharing a worthy information in detail. This is really helpful for learning. Keep doing more. legaltestosteronebooster Wow I can say that this is another great article as expected of this blog.Bookmarked this site. Long time no see your article. I am very glad when see your post. Click here sims 4 cheats to take part in the games. Thank you. Well said!! much impressed by reading your article. Keep writing more. Nice blog!! Hope you share more infor like this!! Thanks for the info! Much appreciated. Great casino, ever best online casino games you can safely put the top ten, with the new year already playing. At first I didn’t enter the topic as it is not hung with all sorts of bells and whistles I used to, but over time you realize that only good gaming games, bonuses and timely payments are needed in the casino, everything else interferes and distracts. Appericated the efforts you put in the content of Data Science .The Content provided by you for Data Science is up to date and its explained in very detailed for Data Science like even beginers can able to catch.Requesting you to please keep updating the content on regular basis so the peoples who follwing this content for Data Science can easily gets the updated data. Thanks for the well-written post and I will follow your updates regularly and this is really helpful. Keep posting more like this. If you use REST, I'll bet you don't know what the 6 constraints of the REST architecture are? Don't know what CQRS is? You had better learn it fast. Do you even know what the Microsoft preferred C# Coding Conventions are? What is a multi-tenant data architecture? What is it you actually say when asked "Why should we hire you?" in an interview? If you are not prepared to answer this question, then be prepared not to get the job. Copyright 2015 Unger Technologies L.L.C.. Theme images by enot-poloskun. Powered by Blogger.